Talks to renegotiate the North American Free Trade Agreement kicked off in August 2017—more than two decades after the deal went into force. The three partners began the modernization process in the face of dramatic changes in the global economy that include new production models, integrated supply chains, technological advances, and a revolution in energy production. As China and other emerging economies rise, North American integration becomes a strategic necessity when it comes to production efficiencies, economies of scale, and comparative advantages. On September 30, 2018, the three countries came together to agree to the text of a new trilateral pact called the United States-Mexico-Canada Agreement (USMCA). This portal showcases AS/COA’s programs and activities focused on the evolving North American relationship. United States: Summary of the Objectives for the NAFTA Renegotiation (released July 17, 2017). Mexico: Priorities for NAFTA's modernization (released August 2, 2017). NAFTA 2.0 Press Conference: Opening remarks from the launch of negotiations. Text of the USMCA, via the Office of the U.S. Trade Representative (released September 30, 2018). This portal showcases AS/COA’s research and activities focused on the evolving North American relationship. NAFTA negotiations could conclude as soon as the end of August 2018, but even if they don't, Mexican President-elect Andrés Manuel López Obrador (AMLO) has signaled his commitment to a successful renegotiation. 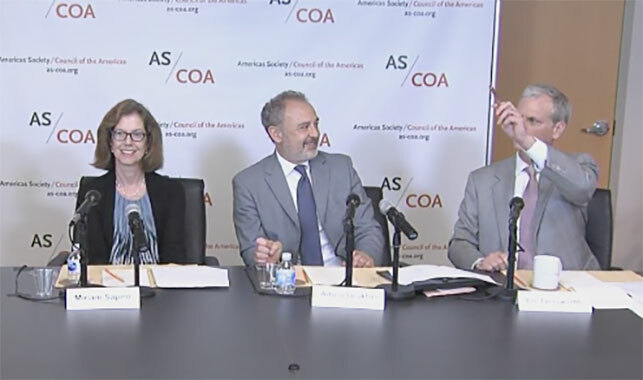 An AS/COA panel covered the challenges that would remain in ratifying the pact under each country’s Congress, areas where AMLO's views on trade overlap with those of U.S. President Donald Trump, and how Mexico should continue to diversify its trade ties overall—especially with China. Our work in Washington includes providing congressional testimony, submitting comments on U.S. policies, and supporting U.S. policies on North American trade and energy cooperation. Through publications exploring the importance of North American integration and programs with decision makers focused on the region, our analysis showcases AS/COA efforts to strengthen trilateral ties. Q&A with Eric Farnsworth: What's at Stake in NAFTA Talks? Video: The North American Trade Agenda - What Comes Next?